“Meatless bean dishes tend to lack savory depth,” but not this one, said Cook’s Illustrated. 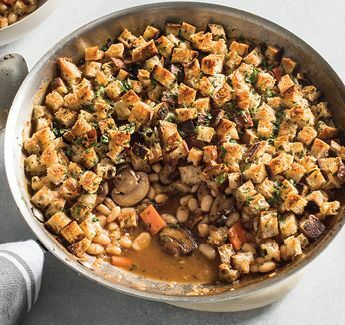 The keys are the generous use of oil, the toasted-bread crust, and a gravy created by sautéing mushrooms and aromatics, then deglazing the pan with sherry. • Preheat oven to 300. Heat ¼ cup oil in a 12-inch oven-safe skillet over medium-high heat until shimmering. Add mushrooms, ¾ tsp salt, and ¼ tsp pepper. Cook, stirring occasionally, until mushrooms are well browned. Meanwhile, toss bread, 3 tbsp parsley, ¼ cup oil, and ¼ tsp pepper in a bowl. In a second bowl, stir flour into 1 cup water until no lumps remain. • Reduce skillet heat to medium. Add onion and cook until translucent. Reduce heat to medium-low; add garlic, tomato paste, and thyme. Cook, stirring, until skillet bottom is dark brown, 2 to 3 minutes. Add sherry. Cook, scraping up browned bits. • Add beans, their liquid, carrots, and flour mixture. Bring to boil over high heat. Remove and cover evenly with bread mixture. Bake in oven 40 minutes, then broil until crumbs are golden brown, 4 to 7 minutes. Remove and cool 20 minutes. Sprinkle with 1 tbsp parsley. Serves 4 to 6.